Whether celebrating a special occasion with family and friends or hosting a corporate event, “The Old Inn On The Green” can accommodate all your special event needs. Dining at The Old Inn on the Green is an extraordinary experience: fine wine, great food, the dining room illuminated by candles, the murmur of conversation from the other room. As Chef and Owner, Peter Platt is always firmly in charge, working to create innovative and memorable meals that are an event unto themselves. 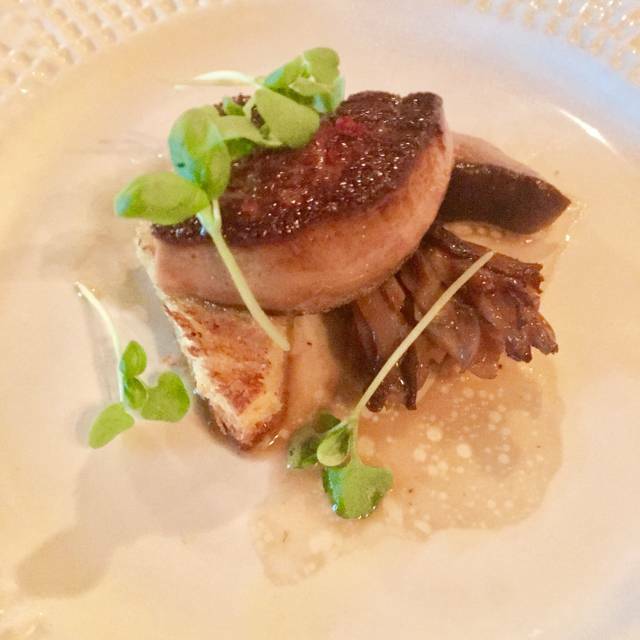 Over the past several years, the Old Inn has developed the tradition of serving a Prix Fixe menu - each Saturday evening a different four-course meal is prepared, and guests are offered a choice of two main courses as well as a choice of dessert. On other nights, the Inn offers a well rounded menu of a la carte items, with specials which change daily. The wine list is graced with a array of thoughtfully selected estate bottled wines from France, California and Italy. The dining rooms are lit entirely by candlelight and there are fireplaces in each room. Comfortably worn windsor chairs and mahogany tavern tables furnish the dining rooms. Tasting menu was awesome — and not one where you go home hungry! Food came out perfectly timed. Most tender lamb ever. Sensational scallop. Special touches on everything. Super romantic ambience. Staff was above and beyond. It was snowing and James actually swept the path in front of me going out to my car. Really a wonderful time. Three years ago our children gifted us an evening at the Inn on the Green for our 35th anniversary, with limo transportation and Crystal champagne included. It was such fun that we decided to repeat the experience each year. We have not been disappointed! In front of a low fire we dined on file bras, lobster risotto, lamb and duck, all of which was superb. Add in the amuse bouche, affogatto, and cheese plate and the entire experience, as ever, was charming and delicious! Truly the most wonderful dining option in the Berkshires. Every plate is a homerun. The service is friendly and professional. And the ambiance is unmatched. A gem in the Berkshires. Top-notch, locally sourced food in a lovely, serene ambiance. Lovely candlelight restaurant. Quality of food was very good. A bit on the pricey side. Staff was very attentive. Food and service were excellent but both my wife and I had severe stomach issues later that night. For prix fixé, the meal still came to $125/person. Not worth the 50 minutes drive! First, the ambiance is unsurpassed in the candlelit and fireplace list dining space. The waitstaff outstanding, food was over the top perfection. Our entrees the chicken and duck was just fantastic. Wine list is awesome. I can’t say enough wonderful things about this gem. Food was delicious. The experience unique (old Inn, eating by candlelight). Food was phenomenal, especially the soups. The server was friendly. A little slow, but he seemed to be o my server. Candle-lit dining only, so neat atmosphere. The food was very good. The setting magical-an 18th century house candle lit dinner, very special romantic setting. You could feel like it is dinner 1821. The prix fixe on the weekends limits options so be sure you are up for a minimum $75 prix fixe 3 course or the large prix fixe before you go. The main entrees and appetizers were excellent. But the desserts, which i never would have ordered had it been ala carte, were exceptional. Truly magnificent, and we tried 6 of them. Go for the beauty and the quiet and the excellent atmosphere and fine food. Service was fair. The wait staff never came to ask how our food was. Noisy group of ladies behind us. Clearly should have gone somewhere else. Beautiful inn serving inventive, delicious cuisine in a charming setting of separate candlelit rooms. 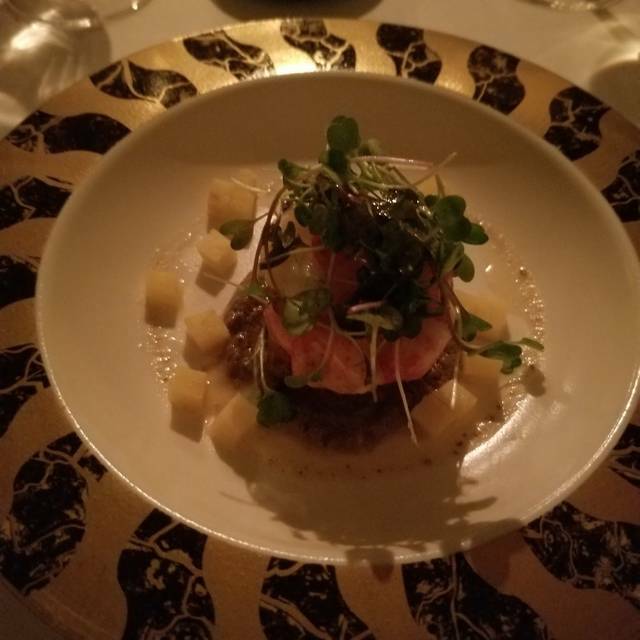 Each of the $46 prix fixe entrees on certain days of the week (chicken, salmon or veal) was accompanied by incredibly flavorful veggies and polenta or couscous. Deliciously prepared and gracefully served. The chef offers amuse bouche and little treats at the end. Will be back. If you like good food, with a side of bad attitude, this place is for you. This is a really odd place. We had a 9:00pm reservation and called to make it a little earlier, and were told no. We assumed the place would be packed when we arrived, so got there early to make sure we didn't lose our reservation, since we had a long drive. When we arrived at 8:30, there were plenty of open tables. 1. There was a group of people lined up at the door with an employee, which we assumed was where we checked in. Upon standing behind them, we were rudely told to just go in by one of the guests (obviously not the restaurant's fault, but was weird. 2. I went to use the restroom and my wife sat at the bar, and was not happy with the way the bartender had treated her. 3. A nice man moved down so my wife and I could sit next to each other, and a waitress was upset that the barstool (the one at the end of the bar) was too close to the door. The food was delicious, and the idea behind the place is kind of cool. We especially want the readers of this review to know how good the food is, and make sure that the kitchen staff are acknowledged. I had a really great glass of wine that I forgot to write down the name of from the menu. I emailed the restaurant, but never got a reply. Really disappointed by this restaurant. The location is beautiful. The inn itself is very pretty lit with candles. We were there on a Friday night and the restaurant was quiet with several empty tables, so noise levels were low. The food was good, but not memorable. The fish was well prepared; the duck slightly over cooked. Lovely assortment of desserts and excellent coffee. The service was adequate but inexperienced and not particularly attentive to details. Overall, very pleasant but we wouldn’t rush back. What a fabulous meal. We had the multi-course tasting menu and kept getting excited about the excellence of the dishes. The chef sent out a few extra surprises as well. That always adds to making a meal special. Everything tasted very fresh and flavorful. Crisp pastry on the vegetable tart, piping hot (beautiful) dishes. Service was excellent and the candlelight ambience is lovely. This was an unexpectedly outstanding experience. What would have been an even better dining experience was not having some of the party of 4 sitting in the waiters’ thoroughfare. Better request a table away from here. Though somewhat "old style", the atmosphere is cozy. The service and food and wine are very good to excellent. A little pricey for "everyday" dining, but well worth the drive and cost for something a little special. This was our third visit for dinner in three years. Unfortunately, the first time was exceptional, the second was good. Our most recent visit was barely adequate, but not the value one would expect in expensive fine dining. We had a reservation and went along with the $50/person fee if canceled within 48 hours. It's a bit much on a weekend with nothing special going on. I wouldn't agree to it again. The setting, all candlelight, is still stunning, even when the sun hasn't set. The clientele are almost all old and rich-looking. They speak loudly as if they were at the country club with their pals instead of a restaurant where there might be others around who don't want to listen to their conversations. We were greeted and seated promptly, brought water and menus. The salads were both very good. We ech had the cod, which was not. It was prepared perfectly, but bland, and paired with a tasteless sauce. It was supposed to be herb-crusted, but it was herb-sprinkled. The desserts were above average. The service was below the minimum. Our waiter seemed uninterested in speaking with us as if he was just going through the motions. He took our order promptly. We don't know if there were any specials. He didn't check on us after our entree was served, and the time to dessert was quite long. He never asked if we needed re-fills on our drinks, which we did. Nice ambiance, candlelight only. Food and service outstanding. Food was perfectly cooked and wine selection was excellent. Our waiter was helpful and efficient. However, the room was way too dark and took away from my enjoyment of the food. If you want to stick to using candles only, you need to have more of them...in particular more that one candle stick per table. Excellent service, ambience and food. Second visit after several years, but just as memorable. Outstanding mushroom soup and perfectly prepared salmon. We had the mid-week special menu, which had few choices but all dishes pleased, except perhaps the (only) dessert provided, some sort of panna cotta creation which upset my stomach because I do not tolerate lactose, but I blame myself for not asking for something else, and/or not bringing lactaid pills with me. My recommendation is for the restaurant to offer an alternate dessert, even if just some fruit or a simple cake. This was the only course that had no options. It was my husband Jeff’s 70 Birthday and we had not made advance plans to celebrate. We’ve come to this restaurant many times over the years and it’s always been a go to place for celebrations. This time we splurged and got the many course tasting menu which was terrific. Each dish was like a work of art and tasted delicious. 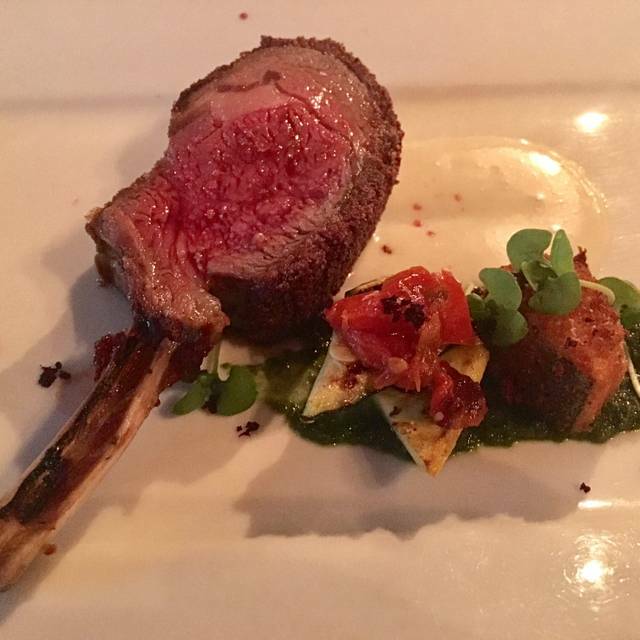 The portions were ample for a tasting menu and you were able to choose among multiple offerings so it still felt personalized and they readily accommodated several food sensitivities and preferences. And the martinis we had to start the meal were incredible. I will happily continue my regular visits to this beautiful elegant restaurant. 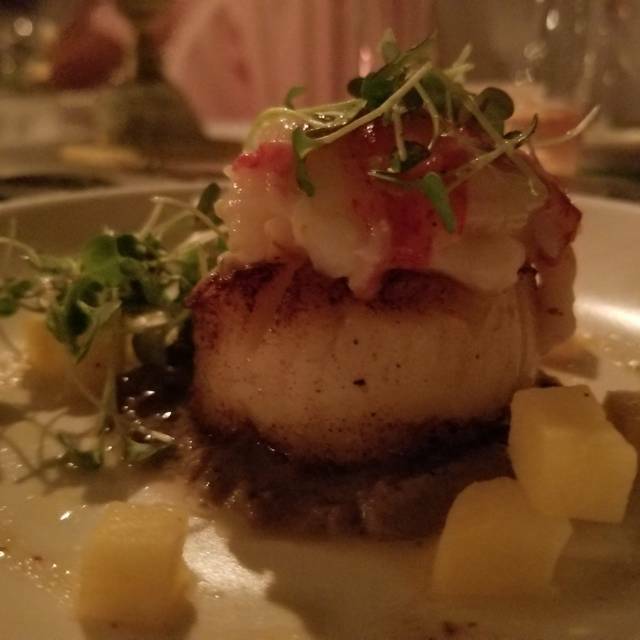 Another unparalleled experience at The Old Inn on the Green—food, drinks, service and atmosphere were all wonderful. There are lots of great dining options in the Berkshires but this is a jewel in the crown. Absolutely the finest dining experience we have had in many years, if not ever. Every bite was perfection. The fireplace and candlelight, no electric lights in our room, was such a beautiful touch in this 18th century inn. Very romantic. Truly excellent service. We can’t wait to return. 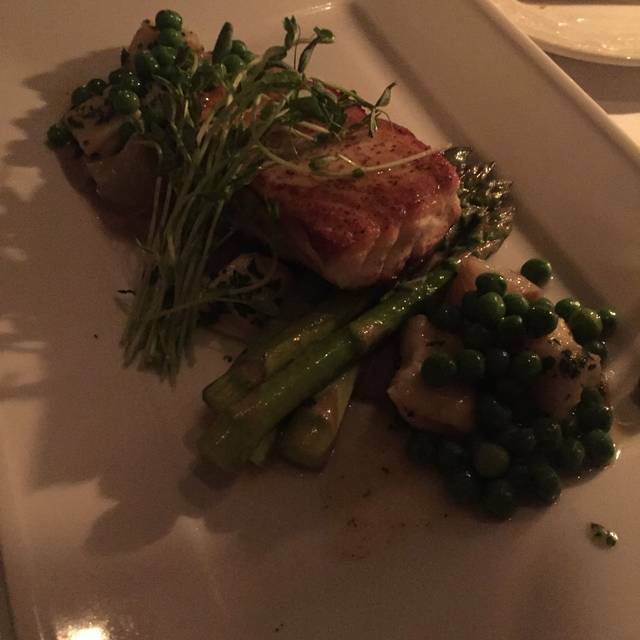 We were traveling to the Berkshires for the weekend and always look for great restaurants to try. We loved our experience here. Delicious food, creative preparation and great service. We’ll come back again! The restaurant is in a fabulous setting in a beautiful area. The food is outstanding. The service was amazing. The Old Mill On the Green has been excellent each time we have indulged in their luscious food. Our server, Ian, was perfect - helpful but not hovering, interactive but not interfering. The venue is quiet, warm, and very attractive, with beautiful wall murals and snug fireplace. The ideal place for our anniversary dinner. A Berkshires gem. Truly fine creative dining with fresh local ingredients at a reasonable price. Candlelit dining rooms, with firelight in winter, create a serene ambience. Excellent, discreet service. One quibble: the bartender the night we went did not know how to make an extra dry martini. But it was cheerfully replaced. Christmas Day. 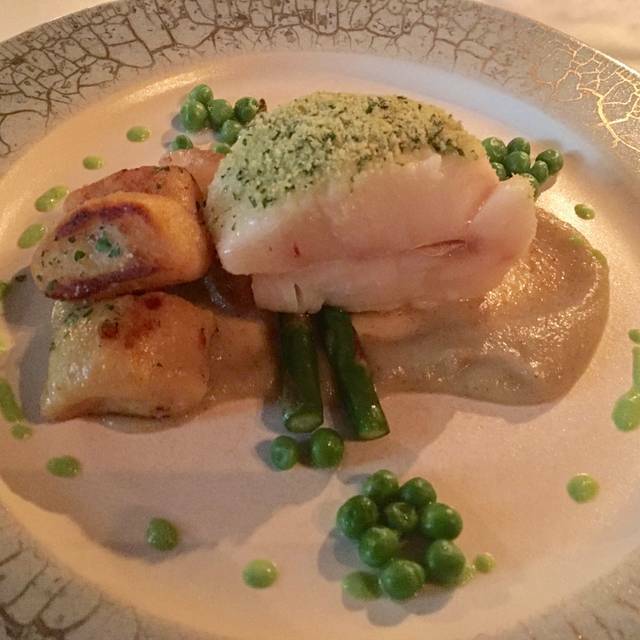 Beautiful room, impeccable service, delicious, special level of food. Amazed at the well-trained staff. A busy day but no sign of chaos. Perfect choice for a special meal! This place is worth the trip, just gorgeous. Only candlelight and very romantic. 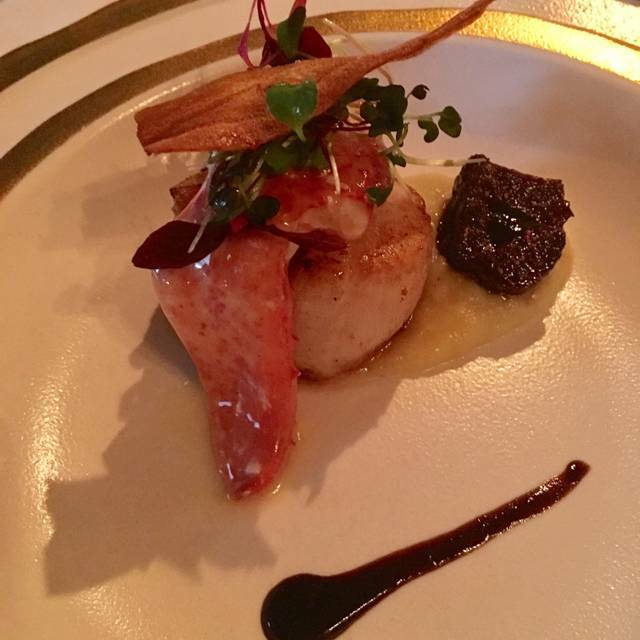 Try the duck and the scallops. Everything was great. Interesting cocktails, the duck was amazing. Magical! Well worth visiting if you are in western Mass. Great food and wine in a unique setting. Outstanding tasting menu. Very old building with lots of charm. No lights in the dinning rooms other than candles on each table and a candle chandelier. Amazing wine list but very expensive. The waiter wasn't very friendly but the entire experience was well coordinated and efficient. New York prices in rural western Mass but overall it was an outstanding experience. Best in the Berkshires - hands down. Candlelit dining room. Exquisitely prepared food. Romantic like no other. Service could have been a bit warmer, but still very efficient. On the pricier side, though still within reason. Class isn't cheap anywhere. And this is classy, pure and simple.